Show Open – Every show begins with a Monty Python intro to a special song that asks a musical question…in the title or the lyrics. “Great Live Moments” – Once in the 11a hour featuring carefully selected live performances by rock icons. In The Noon hour, we play songs recorded in the SF Bay Area or by artists from our scene. Fresh and Frozen – A new song by a familiar group or artist, and a song that they had hit with at some point in their careers. Today’s Special Medley – Musical sets that include tracks from a variety of themes, including songs on a particular subject, from a group or grouping of artists, or from a special year or event in rock history. Who’s the Missing Ingredient? -For example, we play any artist in rock and one from the SF Bay Area who connects with them in three names. Who’s in the middle or ties together all three songs? Local Catch of the Week – In the Noon Hours, Bands and Artists both known and unknown who are part of our local scene. Car Tunes – A song that mixes the two Classic American products, Rock & Roll and the love of Cars and the open road. My Favorite Musicians – Each week we highlight a singer, guitarist, bassist, drummer, keyboard player or other outstanding musician. SF Music Hour – Every Noon we will feature all artists from the Bay Area, those who made a home in the Bay Area and those that found their first big audiences at our concert venues. Bands that we feature in The Noon Hour. Bay Area Bands & Artists: The Doobie Brothers, Jefferson Airplane/Starship, Janis Joplin/Big Brother & The Holding Company, Creedence Clearwater Revival, Santana, Neil Young, The Grateful Dead, The Steve Miller Band, Boz Scaggs, Sammy Hagar, Bonnie Raitt, Journey, Chris Isaak, Eddie Money, Huey Lewis & The News, Greg Kihn, Ronnie Montrose It’s A Beautiful Day, Cold Blood, Tower Of Power, The Youngbloods, Stoneground, The Beau Brummels, Moby Grape, Elvin Bishop, The Tubes, Tommy Tutone, Blue Cheer, Sly & The Family Stone, Hot Tuna, Dan Hicks & The Hot Licks, Quicksilver Messenger Service, The Sons of Champlin, The Chambers Bros and more. Artists who became big in the Bay Area first: The Police, Tom Petty & The Heartbreakers, Peter Frampton, Traffic, The Cars, Cream, Thin Lizzy, Elvis Costello, AC/DC, Steely Dan, Lynyrd Skynyrd, Van Halen and many, many more. Artists who call(ed) the Bay Area home: Fleetwood Mac (Lindsay Buckingham is a graduate of Menlo Atherton HS, and originally formed the Bay Area band Fritz w/ Stevie Nicks. ), David Crosby, Todd Rundgren, Van Morrison, Greg Allman, Bonnie Raitt, & others. Paul “Lobster” Wells was attending the City University Of New York, when he discovered a passion for radio at the campus station. When his his final semester wrapped, he headed for the Bay Area and Stanford University, serving as Music Director of KZSU. He dubbed his Stanford show The Lobster Box, adopting the crustacean tag as his radio name. As “The Lobster,” he quickly garnered fans and accolades, shooting to the top as one of the West Coast’s most popular radio personalities. In addition to finding a home at the Bay Area’s legendary KSAN (Jive95), KSJO, KOME, KRQR (The Rocker), KLIV, KQAK (The Quake) and KUFX (K-FOX), his career has also taken him to Los Angeles at powerhouse stations KMET and KNAC. Wells’ professional broadcasting experience included management positions in programming and music programming as well as “DJ” work. As Music Director and Asst. Program Director of KSJO in the late 70’s, he was instrumental in “breaking” many new rock artists, including The Police, AC/DC and Tom Petty & The Heartbreakers. From 1988 to 1992, his program on KRQR, The Lobster Breakfast, was San Francisco’s top-rated morning show. 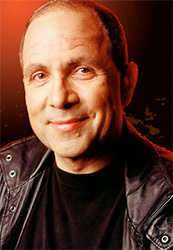 Many of the program’s comedy bits were nationally syndicated and, in 1994, he produced a short form radio series for CBS Radio Networks and was introduced to the company that produced their House Of Blues radio programs. Flow Communications then began to produce The House of Blues Breaks programs for that company, and Wells was asked to join them in 1995. In 1998, he decided to invest his full-time efforts into Flow Communications, and opened a digital multi-track production studio and office in downtown San Francisco, sharing space and handling creative production for Business Radio 1220, KBZS. Wells then spearheaded a project as Director of Programming for the station’s parent company, INR, formulating and producing Talk Radio programming for the launch of Sirius Satellite Radio. In 2002, Flow Communications moved to 69 Green Street, directly across from what was the location of the first FM Rock station, KMPX. That inspired him to create sfbayradio.com and launch The SF Bay Radio Hour. The program, also know as Lobster’s Rock Box, was syndicated nationally and grew to having over 25 markets coast-to-coast, including two in the Bay Area, 98.5 KFOX San Jose and Santa Rosa’s 97.7 The River. In 2005, he teamed up former San Francisco Mayor, Willie Brown, and Political Comedian, Will Durst, successfully signing the progressive talk radio show to mornings at Clear Channel’s KQKE, San Francisco (now Green 960AM). Wells served on-air and as Executive Producer with The Will & Willie Show through 2006. In July 2007, Wells put his weekly Lobster show on hiatus, and returned to the studio with Will and Willie to produce podcasts (in both audio and video versions), archived at willandwillie.com. In the spring of 2008, he returned to 97.7 The River where he continues to host Lobster’s Sunday Brunch every Sunday from 10am to 3pm.